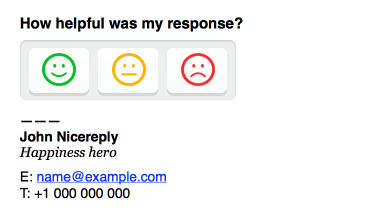 Nicereply is open to all your creative ideas regarding email signatures. Here are some tips to get the most of your email signature. The amount of collected ratings is highly determined by the form of your request for feedback. If you would like to collect maximum feedback, you should put your question and rating link(s) above the signature. Your customers are busy so one more click is usually the maximum they will invest. 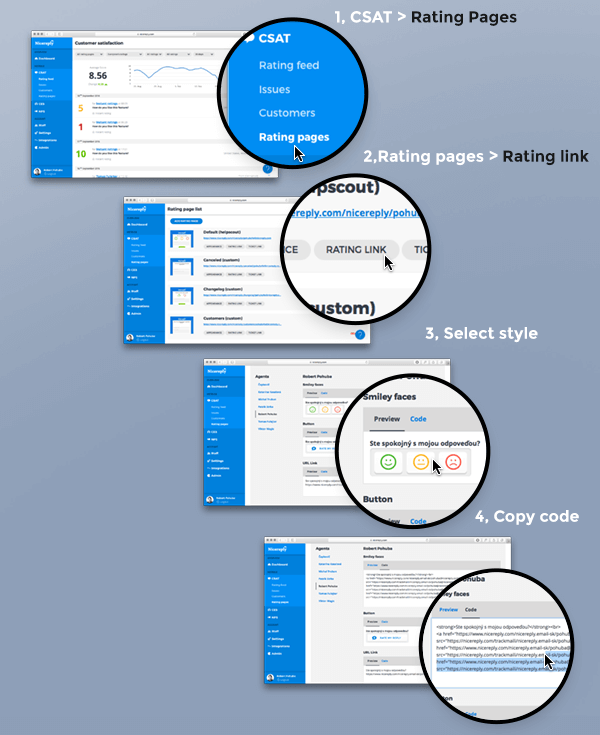 Make the most of this one click using visual rating buttons and instant rating. Yes, you can make any rating buttons you'd like in your signature, but we have to get a little bit technical here. Don't worry, though- it's not rocket-science. Congratulations! Now you are an expert in email signature customisation. Let's look at how we can use these URLs to build our visual rating signature. Each <a></a> tag has attribute href="…" containing our URL to rating form with ?s=N parameter. Each <a></a> HTML tag wraps one <img> tag with src="…" attribute containing URL to image of button and alt="…" attribute containing text alternative description to image content. Important: There is no space or new line between the tag in the HTML code. This is done intentionally to keep buttons/images next to each other without any visual space between them. Those two components ( <a> + <img>) are all you need to know to set up your custom rating signature. Change the src="…" URL in <img> to any valid URL of an image accessible to the public on the internet.